In low-income families, the students themselves take responsibility for saving, earning or borrowing money to cover 32 percent of their costs, and middle-income students pay 29 percent. Students from high-income families cover just 19 percent of their costs; they tend to pay more for their education, so their total dollar costs are higher, which somewhat narrows the dollar difference between what students in each income group pay. 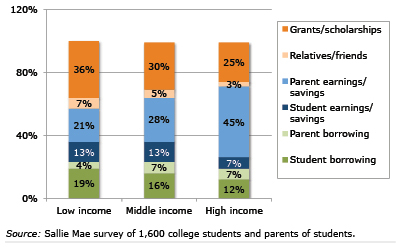 High-income parents, not surprisingly, pay a much greater share of their children’s college costs. Their borrowing and cash payments combined cover 52 percent of the total, compared with 35 percent for middle-income students, and 25 percent for low- income students. Lower-income students get somewhat more help from grant and scholarship funds, which cover 36 percent of their total costs. This compares with 30 percent for middle-income and 25 percent for high-income students. Other relatives outside the immediate family are pitching in more. Between 2014 and 2015, the share coming from these other family members rose from an average 4.3 percent to 5.2 percent of total costs. The data, which are based on a random national telephone survey of 1,600 students and parents, provide a glimpse of who’s paying for the ever-rising cost of a college education. I don’t think these statistics are too surprising. The only surprising thing in this whole situation is how expensive college can be, making it difficult for well-deserving individuals to afford higher education. The debate continues on whether to provide students with a free education, since other countries provide this luxury. Why I don’t think this is the answer, serious discussion and progress needs to be made for giving all the opportunity at a college education and a brighter future. While I understand that it isn’t possible for every student to get a grant or scholarship, I do think that more students could qualify for them. I know that there are millions of dollars unclaimed each year by students who don’t apply for them. In the debate about high college costs, I’ve yet to see anything about what colleges themselves are doing to reduce them! Guess cutting administrative costs, professors pay, football and basketball coaches salaries or what the chancellor makes are simply off the table. Closer to home, see where Maryland’s (former) Gov. Martin O’Malley and his wife are over $339,000 in debt for college for their two children. Worse, they have two more in the pipeline not even freshmen yet. This was as they pulled in over $300,000 in annual income while living the last 8 years on the public dime in the governor’s mansion. At the same time, by his own admission, they’ve accumulated very little in retirement savings. Not sure how this helps qualify him to be president, though it’s clear the guy sorely needs a good job. That figure is compared with the cost of attendance and the determination of a student’s eligibility for need-based aid. Families generally get less aid as their expected family contribution comes closer to the cost of attendance.